Following successful completion of their examinations: Dr. Nasima, Dr. Hajera, Frau Wienbeck, Dr. Najla, Dr. Sediqi, Dr. Samea. 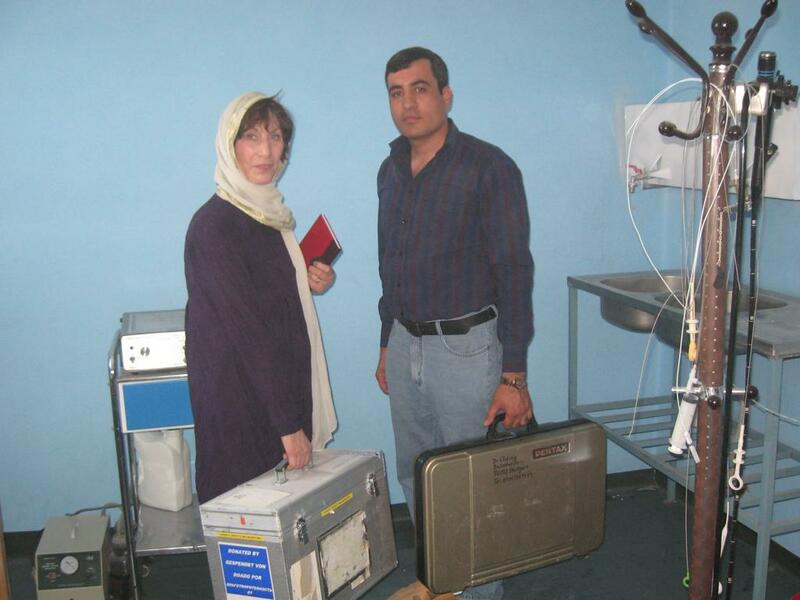 In the foreground: additional endoscopy equipment brought by Frau Wienbeck. 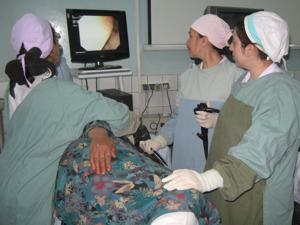 The one-year course in gastro-intestinal endoscopy for women doctors was successfully completed. 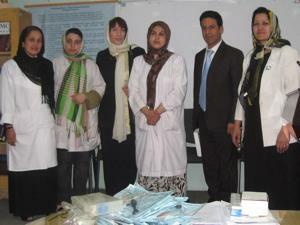 The women doctors completed the course with very good results. The course demonstrated that the Foundation's guiding principle of "help for self-help" really works in practice. 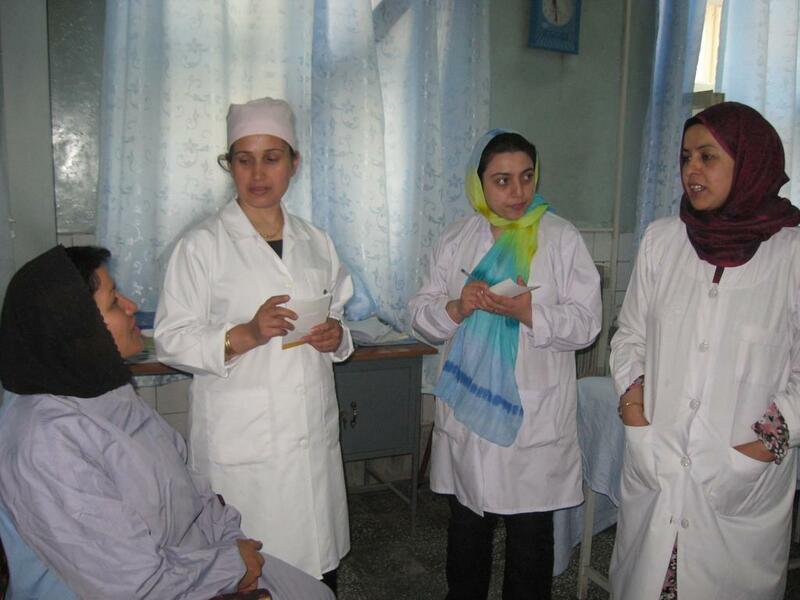 The women doctors, who were trained by the Foundation in 2003-2004, proved themselves to be highly competent instructors. The course was funded by the DAAD (through the DAMF). The DAAD also provided the funds for the purchase of the additional endoscopic equipment. 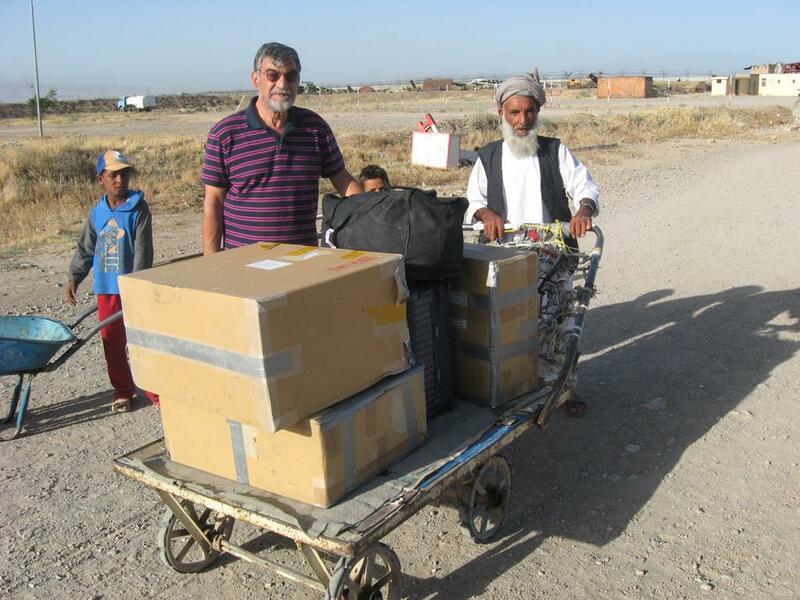 Addtionally, as we were fortunate enough to be given further equipment by the Düsseldorf University Clinic we were also able to supply the endoscopy centers in Mazar-i-Sharif, Herat, Kunduz and Kandahar. 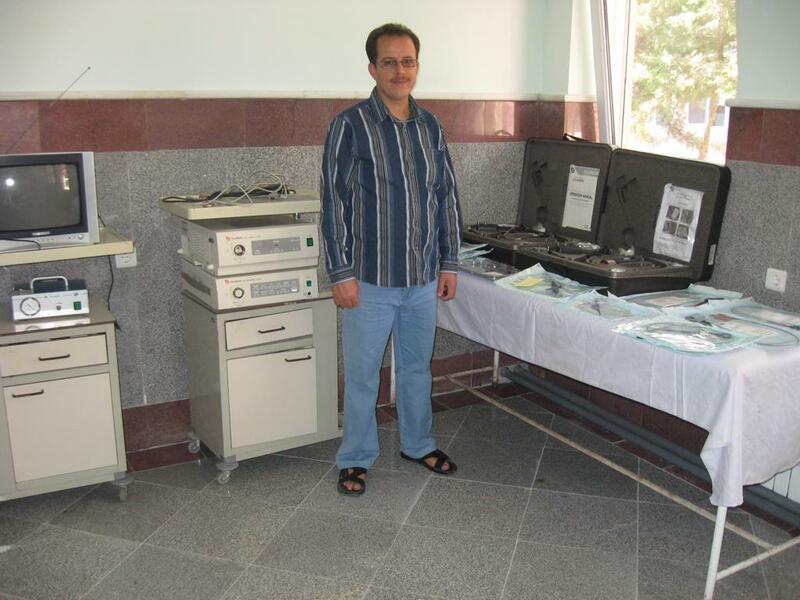 At this point, may we repeat our appeal: we have a continuing need for endoscopy equipment in good condition for the centers mentioned above. The Afghan Ministry of Health is not in a position to procure such equipment. 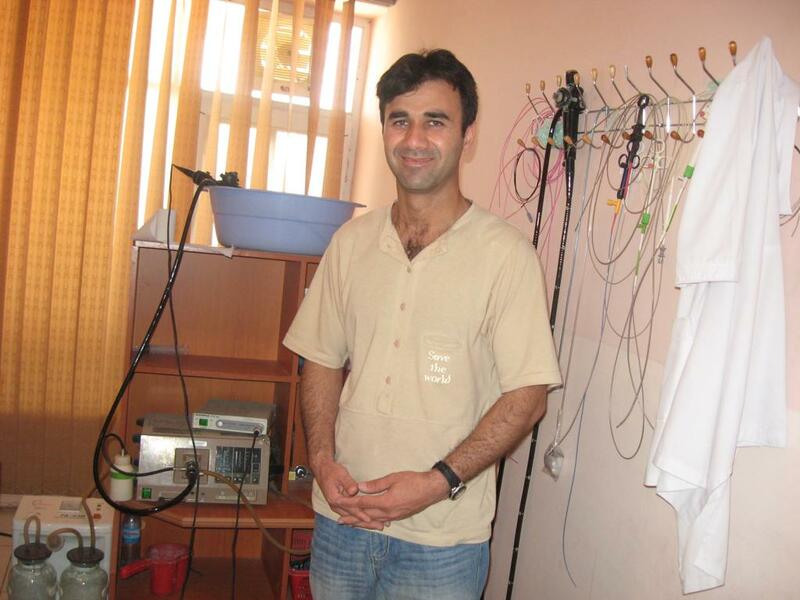 The endoscopy centers in Mazar-i-Sharif and Herat were set up in 2005 for doctors who had just been trained by the Foundation at that time. Not all the endoscopes supplied then are still operational and replacements are urgently required. 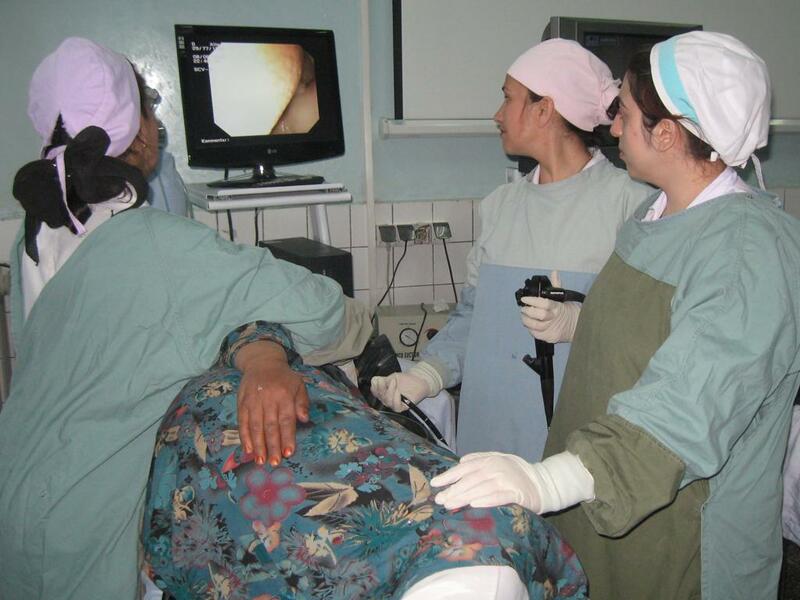 Fujinon Europe donated a well preserved Videoendoscope equipment to the Herat Regional Hospital. Without this donation, the endoscopy department at this hospital would have had to close. The salaries in the Health Ministry Clinics are so low that the doctors are obliged to work in their private practices in the afternoons so as to be able to support their families. 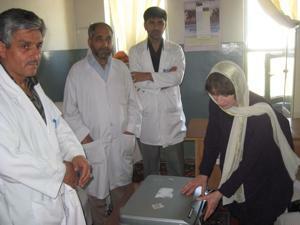 Dr. Ataullah Zulfacar of the Doctors' Association for Afghan Refugees, provided constant help and advice to Mrs Wienbeck during her visit. Here, Mrs Wienbeck is seen thanking him for all he did. Due to security reasons, Mrs. Wienbeck could not travel to Kunduz and Kandahar. The equipment that had been brought to Afghanistan was mailed to the endoscopists at these locations.